Arts+Leisure is excited to announce Infinite Infinite, an exhibition of new work by Aimee Odum. Melding video, ceramics, and fragments of a variety of sculptural and technological materials, Odum forges a dialogue between nature and technology, juxtaposing physical tactility with the conditions of the digital screen. In Infinite Infinite, the artist expresses the constructive and creative potential of this interplay, drawing the intrinsic elements of each into enigmatic sculptural assemblages. 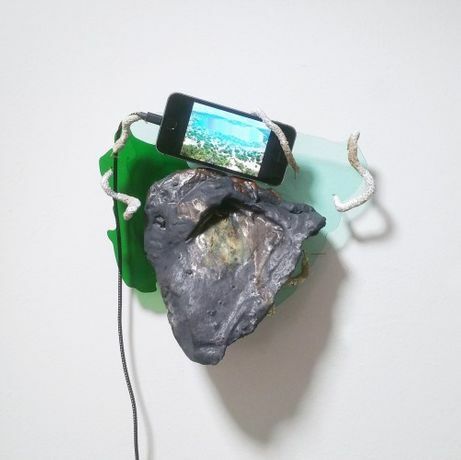 Embedding, which consists of a glazed ceramic rock, acrylic glass, and copper wire, also includes an iPhone playing a single channel video of a desert landscape augmented with a digital rendering of a shimmering lake. Here, the fusion of nature with technology takes on an almost utopian character, marked by a digital intervention upon a barren locale. The Other pairs a clay ladder with a projection of the same object, further commenting on the liminal state that exists in the overlap of the real and the digital. The projection surges and pulses, contrasting with the solidity of the clay form, calling attention to the constant flux that underscores the relationship of the two spheres. Infinite Imprint, another work featuring an iPhone, lies firmly in this ambiguous space. 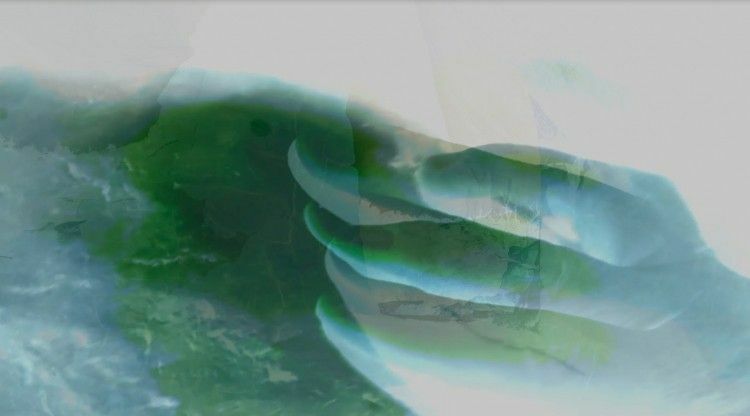 Nestled amongst amorphous sculptural objects, constructed with both natural and synthetic materials, the role of the technological device is obfuscated, instead integrated into a unified melange of materials and origins.